“Johnny is a tremendous example of the positive results that can happen when children are provided a top-notch education, a nurturing environment, and the opportunity to find and hone their passions,” said Pete Gurt ’85, president of MHS. Milton Hershey School® has named Johnny Mills ’75 the 2016 Alumnus of the Year, recognizing his talent as a renowned musician and the example of excellence and philanthropy he sets for MHS students. The MHS Alumnus of the Year Award began in 1954. Recipients of the award have demonstrated humanitarianism and exemplary service to others, achieved distinguished service in their careers, and exhibited high standards of achievements, both personally and professionally. Mills enrolled at MHS when he was four, and discovered his gift for music while at the School. 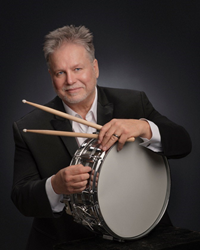 He was a member of the marching band, went on spring tour with the Glee Club, performed in Parent Weekend programs and served as the principal drummer in the Spartan Orchestra. Several adults on campus helped nurture Mills’ musical talent. His Senior Division housefather allowed Mills and members of his band to use a small outbuilding near their student home for practice. “We would spend hours and hours jamming and practicing songs in that old shed,” Mills said. After graduating from MHS, he traveled from city to city in an attempt to launch his musical career, but had little success. In 1979, he returned to central Pennsylvania where he met and married his wife, Anita, and they began to raise a family. It was then Mills took the advice of his MHS mentor, the late Warren Cromleigh ’39, and began taking private lessons with legendary jazz drummer Joe Morrello. In addition to studying with Morrello, he played in three local bands while working a full-time job to support his growing family. In the mid-1980s, a chance meeting with drummer John Dittrich of the country-rock band Restless Heart prompted Johnny to move his family to Nashville. His big break came when he was invited to audition for legendary star of stage and screen Jerry Reed. Mills was Reed’s exclusive drummer for 12 years. He recorded four CDs with Reed and can be heard on his #1 parody hit, "Tryin’ Stuff On,” and the video recordings "When You're Hot, You're Hot," "East Bound and Down," and "She Got the Gold Mine (I Got the Shaft)." Mills has recorded with other well-known musicians, including guitarist Brent Mason and legendary saxophone player for the Beatles Jim Horn. Having toured both nationally and internationally, he has shared the stage with artists such as Chet Atkins, Shelby Lynne, Glen Campbell, Bill Monroe, Darryl Worley, Dierks Bentley, The Smothers Brothers, The New Jersey Symphony, Bobby Bare and other Grammy Award-winning artists. Beyond his career, he is an active member of his Fairview, Tennessee community. He also volunteers at his church, is a member of two local Nashville bands that play for charities and fundraisers, and donates time to Achilles International. He uses his music industry knowledge to mentor and advise students and those trying to break into the music business. He also volunteered with his local high school band and drum line. Mills credits the examples of Milton S. Hershey and his mentor, Warren Cromleigh ’39, with teaching him the value of giving back. Milton Hershey School will honor Mills during a special recognition dinner on Saturday, June 11. He will address students and staff in a tribute to MHS founders Milton and Catherine Hershey during commencement on Sunday, June 12. More information about Milton Hershey School can be found at mhskids.org.